Orbis Interactive are experienced web design professionals, with over 13 years’ experience of creating cross-browser compliant, mobile optimised websites to clients in and around the Wirral, Chester and Liverpool areas. Our business has been built on reputation, and the majority of our work is generated through recommendations and repeat business. We offer the complete range of web design and development services and we have built and maintained websites that compete in some of the UK’s most competitive markets. From static brochure websites, to content management and e-commerce websites; we have the experience to customise a tailor-made solution that fulfils your requirements and within your budget. Our approach to a web design project is similar to any other digital marketing project; we work with you to find out about your requirements and business objectives, we assess your competition and position within the market, and finally we identify how we can add genuine value to your business and boost your online presence. With more online searches taking place on mobile than desktop, it has never been more important to have a mobile optimised website. 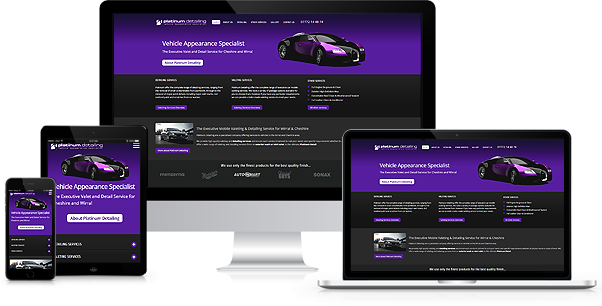 At Orbis Interactive, we don't just build responsive websites – we specialise in it! All of our websites are built mobile responsive as standard, and even if you don't need a brand new website and want to your existing website to work on mobile – we can help too! Keeping website content fresh and up-to-date has never been more important – particularly when competing within the top spots of your friendly neighbourhood search engine! Our Content Management websites give you the freedom to manage and maintain your website without having technical expertise in website coding. Once built, we'll work with you to make sure you understand how to write for and maintain it, to ensure you get the most out of you website. Selling online has never been more competitive and setting up you online business can be more than a little daunting. We are experienced internet marketing professionals who have specialised in the development and marketing of e-commerce websites for the past 7 years. We can not only help you set up you online shop, and optimise it for search engines and mobile; we can also offer advice and guidance on how you can get the most out of it.